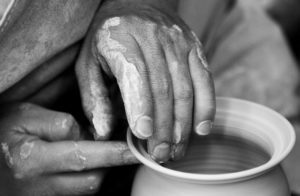 Learn to throw on the potter’s wheel! During this 4 week course you will learn the fundamental basics of throwing, trimming and glazing. With instructor demonstrations and hands on teaching you will learn to construct your own bowls, vessels and mugs. Please tie back hair and bring an old towel and apron to class. Price includes 1 bag of M340 clay, all other materials, use of tools and 4 free drop-in sessions to be used by the end of the course. Additional clay is available for purchase at the VCAC front desk.